Tiablo A9 (XP-G R5) Special Edition Review: RUNTIMES, BEAMSHOTS, and more! Thread: Tiablo A9 (XP-G R5) Special Edition Review: RUNTIMES, BEAMSHOTS, and more! UPDATE SEPT 19, 2010: 100-Yard beamshots added to this review. 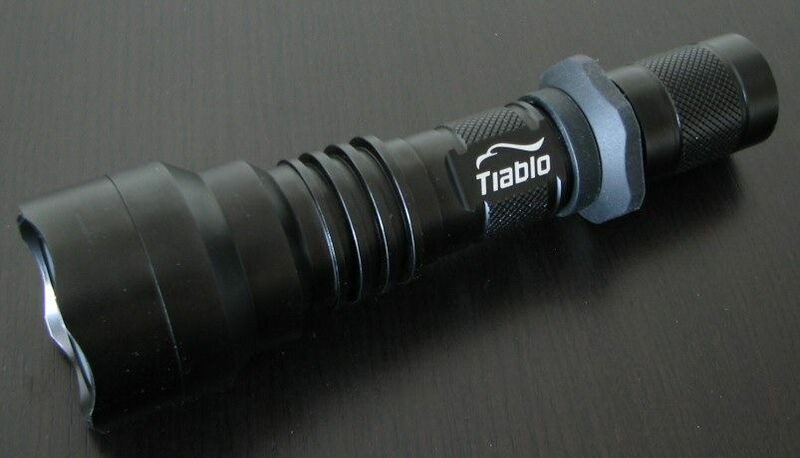 The Tiablo A9 has been something of a standard in the "thrower" flashlight world. It has been around for around almost three years now, and its build has remained relatively stable (with a Cree XR-E Q5 emitter). Although I haven't done a stand-alone review, the A9-Q5 was included in my earlier Thrower Round-Up Review. About a year and a half ago, an optional aspherical optic head (collimating head) was developed, for maximum throw. Despite the launch of new "thrower" lights (e.g. 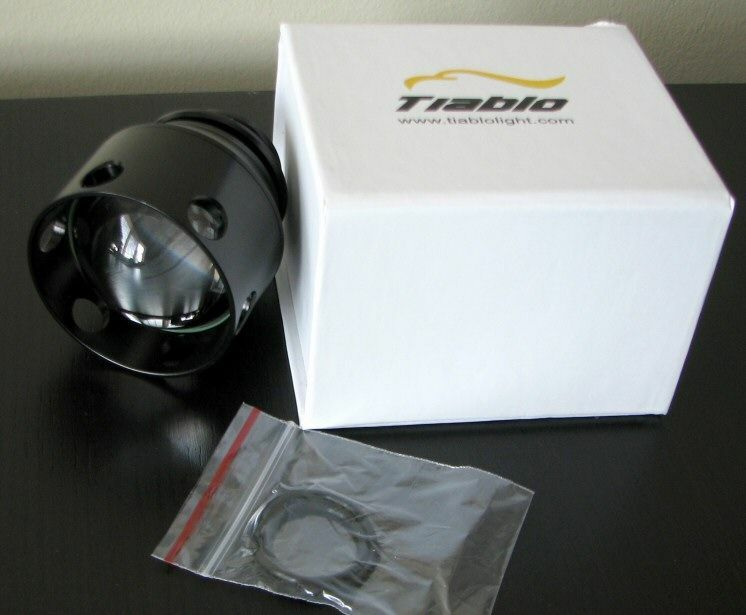 Tiablo A10-G), Tiablo has continued to produce this simple, straight-forward thrower at a reasonable price. Today, an updated version of the A9 has been released, sporting the latest single-die emitter, the Cree XP-G R5. Note that the original A9-Q5 version is also still available - Tiablo hasn't discontinued it, but offers the A9-R5 as a "special edition". Manufacturer Specifications: (taken from the Tiablo website). Step down constant current driver. High efficiency with dual mode DC-DC regulator (PWM / PFM), working voltage is 2.75V to 10V.Supports three battery sizes: one 18650 Li-ion battery, or two pcs CR123A, or RCR123A battery. 2. Low output: 300mA at 60 Lumens for 8 hours (after 8 hours on low output, drops below 60 lumen with total run time over 24 hours). Weight: 155 g / less than 5.5 ounces excluding the battery. The aspheric optic head hasn't changed from before. Those of you who already have one of these from the earlier A9-Q5 edition can relax, it still fits fine on the newer A9-R5 model as well. 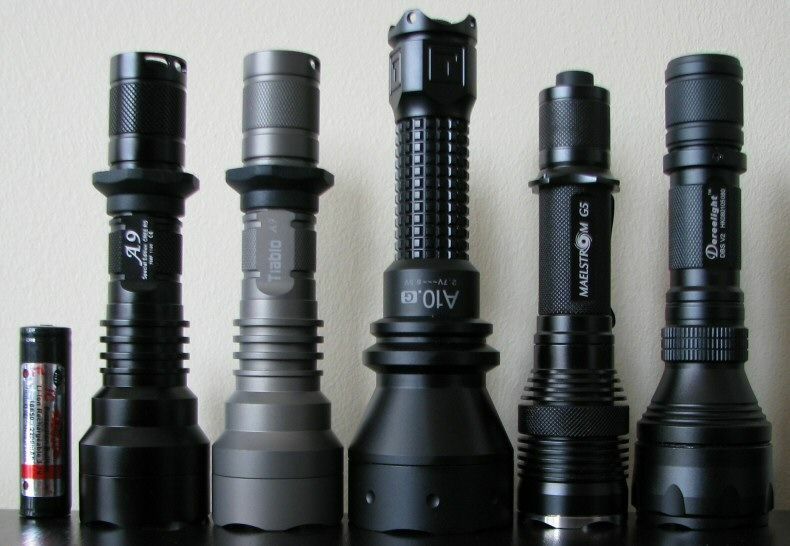 From left to right: AW Protected 18650, Tiablo A9-R5, A9-Q5, A10-G, 4Sevens Maelstrom G5, Dereelight DBS. The external build of the A9-R5 doesn't seem to have changed from the earlier A9-Q5. Except for the new emitter (and raised plastic contact disc in the head), it looks pretty much the same. However, Tiablo informs me that seal for the front lens has been improved on newer models (they claim to have tested it up to 22m under water without failure). Anti-shock has also been improved, and they report the light survives 7m drops onto concrete. 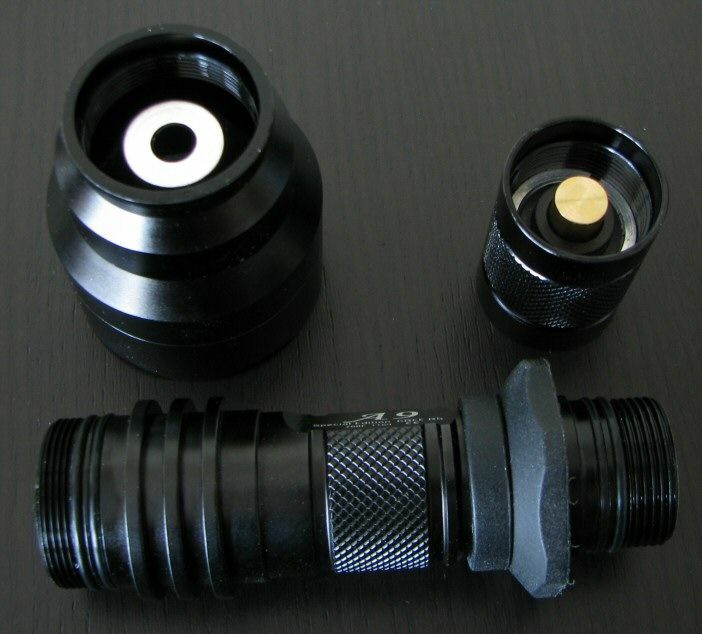 The light features anodized screw threads, allowing for tailcap lock-out. Letter is sharp and clear, bright-white against the black matte background. Anodizing is type-III HA. 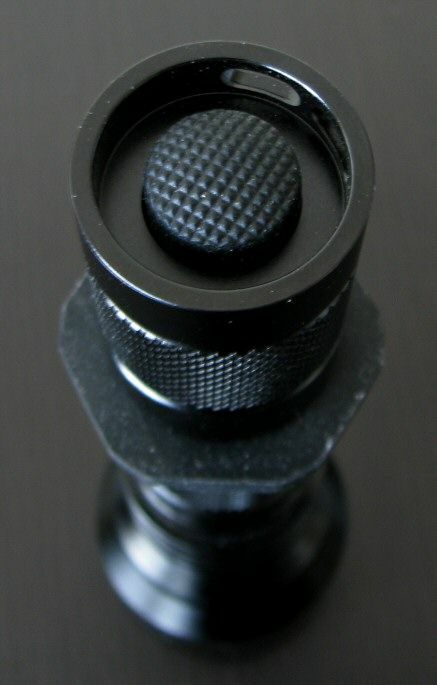 The tailcap spring is encased in a gold-plated contact cover. The light comes by default with a reverse clicky light, but a single-stage forward clicky switch is also available. The emitter appears to be well centered on my sample. Sorry for the quality of the white wall beamshots – I’ve recently moved, and haven’t had a chance to set up a proper beamshot closet yet. What you are looking at below is un-primed drywall, with a range of spakle/sanding marks. To better show you the hotspots, here is a close-up taken when the lights are ~5m away. 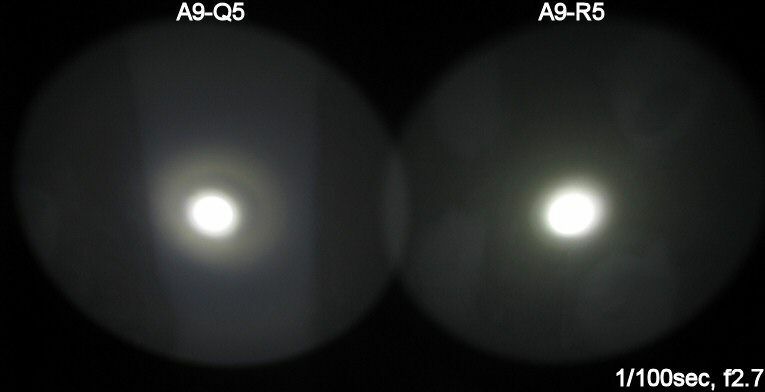 As you can see, the original A9-Q5 is more focused for throw (as expected), with a broader hotspot on the A9-R5. The newer XP-E/XP-G emitters are built differently from the earlier XR-Es, and don't typically focus as well. But on the flip side, the beam profile of the new A9-R5 is nowhere near as ringy as the original. 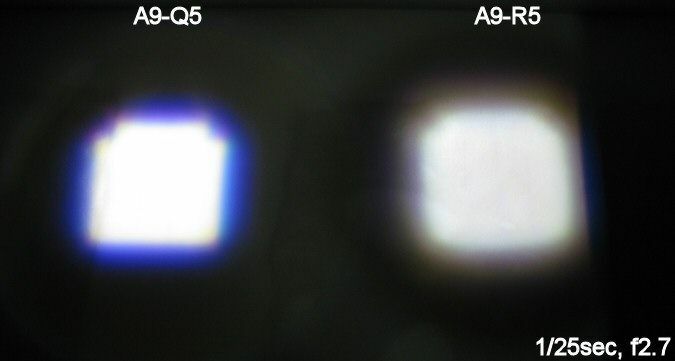 Although these shots don't show it well, the A9-R5 is brighter overall compared to the A9-Q5 (the difference becomes more marked over the course of a 1x18650 run). Scroll down to my runtimes for more info. 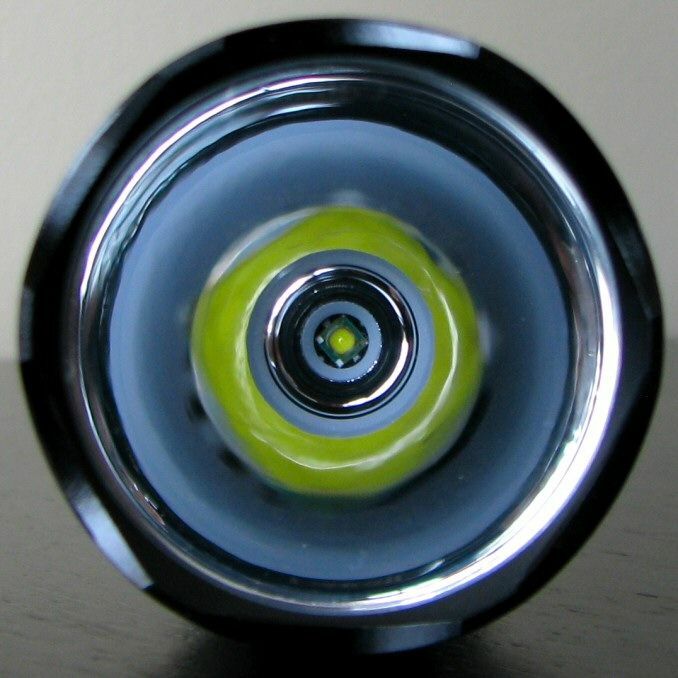 How about the aspheric optic? Here we go again at ~5m, with each light maximally focused. 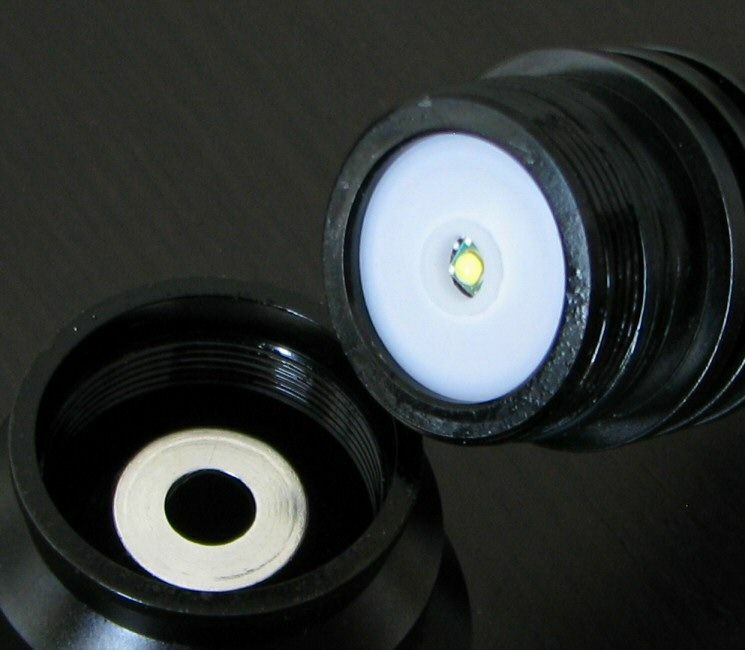 At peak focus, and aspheric optic produces a clear outline of the actual emitter die. The A9-R5 does not seem to produce as bright or as sharp a die image as the A9-Q5. 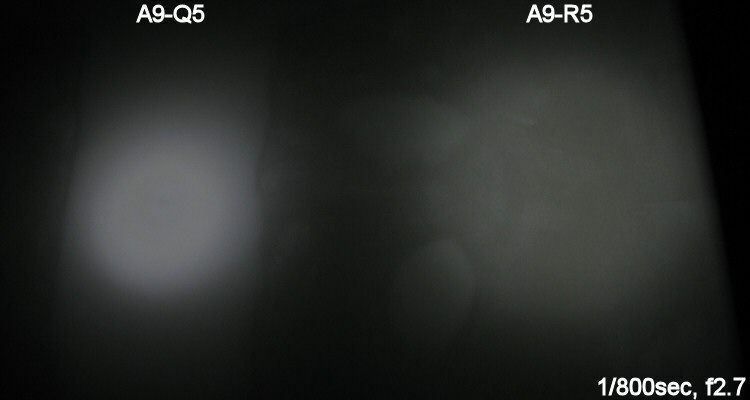 However, there is less evidence of the chromatic aberrations that are common on A9-Q5 emitters (i.e. the blue, yellow, and magenta fringing). This hasn't changed on the A9-R5. With the standard reverse clicky, click and release for the light to come on in Lo mode. Click and release again for it to advance to full power. Click again to turn off. The original A9 didn't feature a multi-level circuit (rather, the Lo mode was created by a resistor in the tailcap). This revised A9 XP-G R5 appears to work the same way, as you need to click through the tailcap to move through modes. The "dual-mode DC-DC regulator" in the specs must refer only to regulation on the Hi mode. Consistent with this method operation, I was unable to detect any sign of PWM on either mode. There is no strobe/SOS modes. Testing Method: All my output numbers are relative for my home-made light box setup, a la Quickbeam's flashlight reviews method. You can directly compare all my relative output values from different reviews - i.e. an output value of "10" in one graph is the same as "10" in another. All runtimes are done under a cooling fan. All throw measures above were taken at 5m and extrapolated back to estimates at 1m. 1m actual measurements would give you highly misleading results, as the beams of thrower lights don't have time to converge by that distance. Also, my throw numbers may be lower than some - I take all readings from the center of the die image. If you "hunt around" the border areas of the die image segments, you can get regional pockets that score much higher However, since it is hard to reliably identify these, I choose instead to stick with the center of the die. Note that the output level of the Lo mode is variable, depending on battery source used. Basically, the overall performance characteristics of the A9 haven't changed - the overall output has simply increased. As before, the light is fully regulated on Hi on 2xRCR/CR123A and appears to be direct-drive on 18650 at a slightly lower output level (as is common on multi-power lights). On Lo, the light's tailcap resistor produces a classic slowly dropping off pattern. The resistor reduces the output on Lo by differing amounts, depending on the battery source used (only 18650 is shown above). In keeping with its older design, the A9 is a single-stage circuit that uses a resistor for its Lo mode. This is less efficient than most modern multi-stage circuit designs. It is also more variable, as the resistored-Lo output level will vary depending on the battery source used (i.e., on the input voltage). While overall output has increased, throw is not as great as the earlier XR-E Q5 version (as expected for a XP-G). Throw with the aspheric head is similarly reduced compared to the earlier Q5 version. 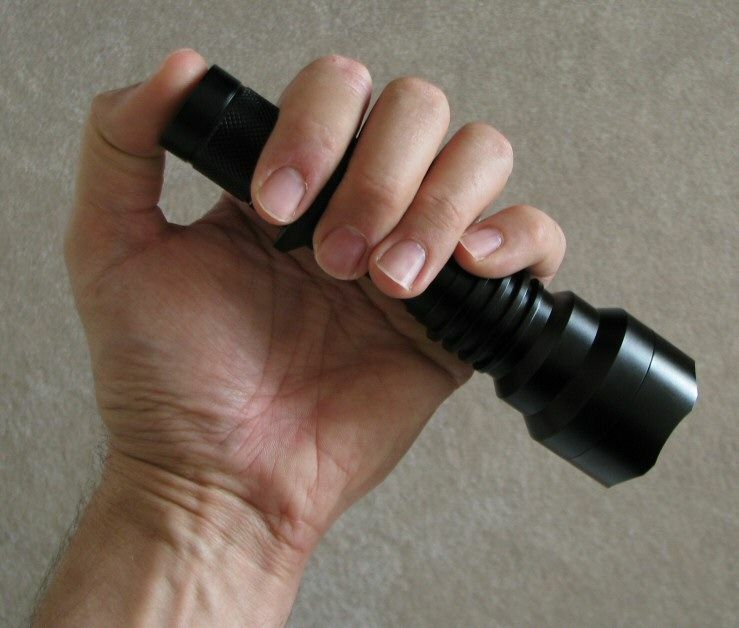 The Tiablo A9 has remained one of the more popular “budget” builds in the multi-power thrower class of flashlight. Its longevity is a testament to its simplicity. Of course, the resistored-Lo mode may be a surprise to many here who are used to modern circuit-controlled multi-level lights – but it gets the job done. The XP-G R5 upgrade gives you a nice bump in output compared to the standard XR-E Q5 version. Tiablo has done a good job in maximizing throw while minimizing beam rings on the A9-R5. However, consistent with the build differences of these emitters, the XP-G R5 has less throw compared to the XR-E Q5 (true for both the standard reflectored head and the optional aspheric head). Still, throw is actually excellent for a XP-G-based light. On 1x18650, the A9-R5 matches the throw of my 4Sevens Maelstrom G5, although with a bit less overall output. On 2xRCR/CR123A, the A9-R5 pulls ahead slightly in terms of throw (while still being somewhat lower overall output). 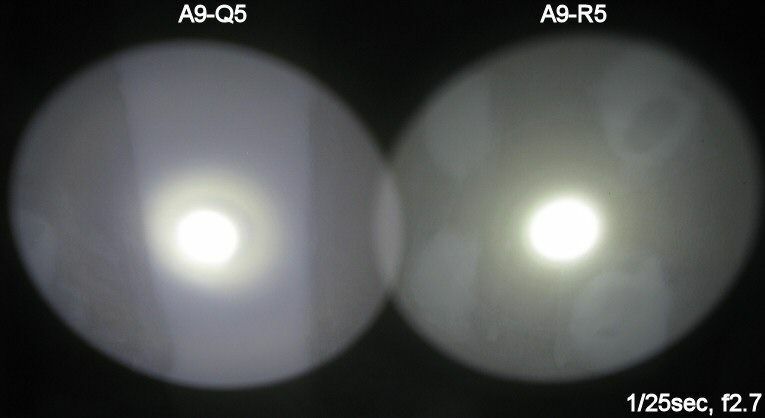 Note that the A9-R5 also has a wider and dimmer spillbeam than most lights, due to its larger reflector. The aspherical head results are interesting, as there is a lot less blue/yellow/purple fringing when the optic was used on the A9-R5. While absolute throw is lower than the A9-Q5, I still consider this an improvement – it throws a nicer beam profile. This is especially true if you slightly defocus the optic to remove the “space invader” look of the die-projection. The new XP-G R5 is a functional and serviceable upgrade – in terms of output and beam pattern - to the standard A9-Q5. Throw is reduced however, so it is important to consider what matters to you in this class of light. 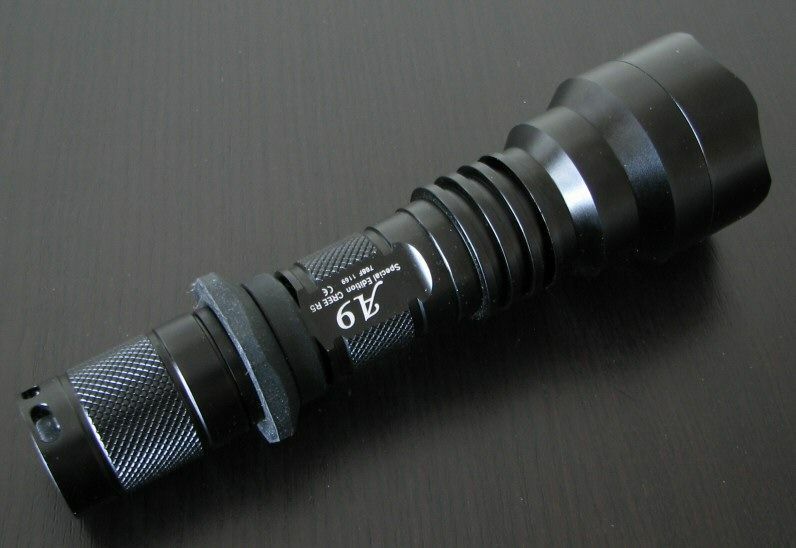 The A9-R5 light and optional optic head provided for review by Kit-Tronics.com on behalf of Tiablo. CR123A batteries provided by Battery Junction. Last edited by selfbuilt; 02-16-2012 at 09:49 AM. 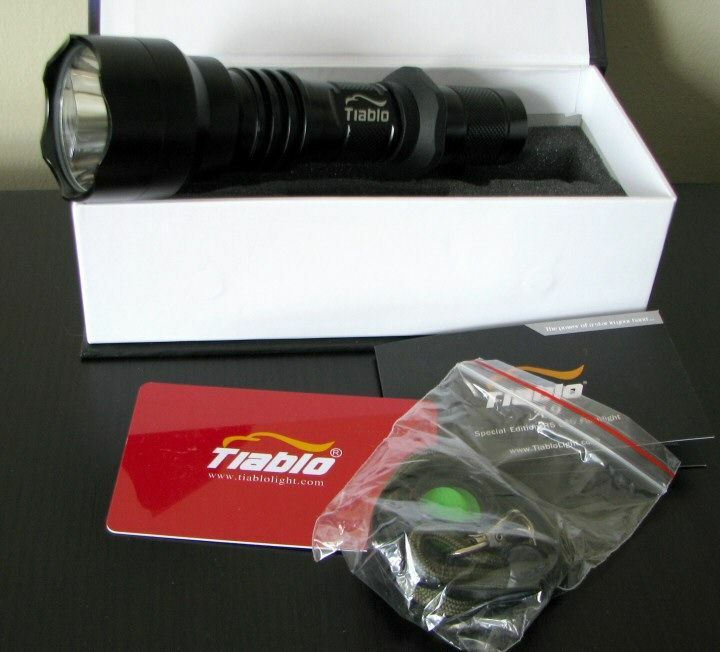 Re: Tiablo A9 (XP-G R5) Special Edition Review: RUNTIMES, BEAMSHOTS, and more! Thanks for the review. I'm little bit surprised by relatively low lux numbers with aspherical head. I measured 69k lux with Q5 and around 40k lux with R5. And with other flashlights I usually get little bit lower readings than you. Maybe you didn't set the best focus. I have just clarified my sampling methodology in the review - basically, I take all readings from the exact center of the die image. If you "hunt around" the border areas of the die image segments, you can get regional pockets that score much higher (sometimes a lot higher - especially in the corners). However, since it is hard to consistently identify these areas, I choose instead to stick with the center of the die. This way I can insure I am samping from same area of each light. Plus, I figure most people would shine the center of the beam at what they want to look at, so it seems the most representational to pick that. But I know most of the time, people sample on lightmeters by "walking" the beam over the sensor, and go with the highest reading (which for a reflectored light should be center). I don't think that works so well for aspherics, since there brightness varies so much over the projection. But it may explain the difference in readings. It is true that with aspherical you usually get the highest reading on the chip near the bonding wires. But I don't think that the difference can be so high, especially with XR-E. The seal for the front lens has been improved compared to earlier A9-Q5s. They claim to have tested it up to 22m under water without failure. Anti-shock has also been improved, and they report the light survives 7m drops onto concrete. THANK U ON REVIEW OF TIABLO A9 R5!!!! Well I don't think they made improvement. Q5 runs much better in this flashlight. They should consider putting R2 emitter inside. Instead of increasing performance they decreased it. Why? - U can make it better regulated on 18650 batteries because they give better runtime and much easier to use. - Aspherical lenses are awesome but they are bit loose when in best focusing point(u got to put distancers to make it firm), and focusing ability is not so god. I sold over 50 of A9's and aspherical heads dear Tiablo and I know what people want. Most of people were hunters. Most of them use only aspherical upgrade head with it so I think U should consider developing it in that way to make it more powerful. It's true that overall output hasn't increased as much as might be expected (typically intermediate between most XR-E R2 and XP-G R5 lights in my collection - and closer to R2 levels). But I don't know if XR-E R2s would be much of an improvement over the Q5s, based on other lights I've tested. I suspect it's an issue with typical Vfs found on different output bins, but a lot of recent XR-E R2 equipped lights seem to suffer in terms of runtime lately. And many of them don't seem to be any brighter than traditional Q5s either, which is a bit puzzling (I'm guessing a lot of R2s are coming out at the lower end of the bin these days). This may be why Tiablo went with the XP-G R5 over the XR-E R2 ... you might not see any output difference with a R2, but could have reduced runtime. I would say the XP-G R5 edition is aimed at those who want a smoother beam with a higher output bin (even if it doesn't translate into a huge output difference). On the plus side, Tiablo is still making the standard Q5 version available, and plans to continue to for some time. I think that R2 would be much better than R5 and Q5. One is equipped with R2 turbo emitter and other with R5 turbo emitter. A lot of people have A9's so this is really interesting, good choice thanks Selfbuilt. So does that mean that the A9 with the Q5 LED throws better than than a Malelstrom G5 in your opinon? Just asking because you mentioned that the A9-R5 matches or betters the G5 and if the R5 has less throw than the Q5 version then I'm really happy I didn't get a Maelstrom then to replace my A9-Q5 (especialy now that they've probably upset a few first version buyers by changing the G5's UI). Personally I couldn't see the value in a light costing twice as much when I had this already with the aspheric for hunting as well. Last edited by snala; 09-17-2010 at 01:59 PM. All things being equal, yes, a XR-E R2 should make a better thrower than a Q5 of the same type, due to the higher output. But the difference isn't huge (depending on where you are in the bin - may not be noticeable), and runtime could actually go down (as I've seen a number of times). This is why I've never been in a hurry to "upgrade" a XR-E Q5 light to R2. Depending on natural bin variability (and other factors like tint and Vf variability), you never know if you are really going to get an improvement or not. Again, the XP-G R5 is simply a different type of emitter, for those who prefer that sort of thing. You definitely need to accept less throw with the XP-Gs, for a given reflector size and drive level. Yes, the A9-Q5 will throw better than the G5 (R5-equipped). This is why the A9 has remained so popular as a "budget" thrower. 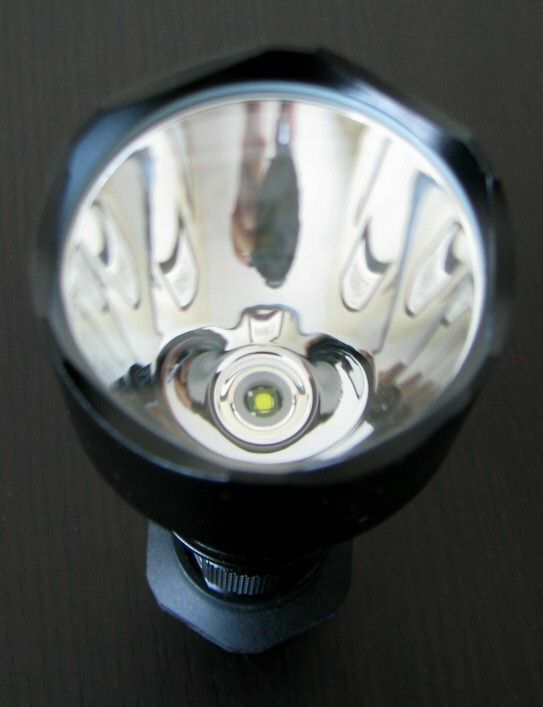 The G5 may make a better general purpose light though (thanks to all its output modes). I also find it's throw more than acceptable for regular use (hunting could of course be different). Another thing with the G5 - since the spillbeam is narrower, this actually gives you brighter spill than the A9. That can come in handy for up-close distances (i.e. <10m). I would say the G5 is very well suited to its intended audience (i.e. LEOs), that need good throw and output flexibility. So with R2 it would fry even more R5 not so good. edit: Did U run it on 2×123 ? Last edited by Tatjanamagic; 09-20-2010 at 08:42 AM.